When I fist moved to the United States I found kolinsky sable brushes in short supply due to import restrictions imposed by the Fish and Wildlife Service. This should not have been surprising, Americans are strong believers in valuing animal welfare over potential profit and the use of government regulations to improve society. This did, however, create a problem for me as I am incapable of looking after my brushes and need replacements on a regular basis. 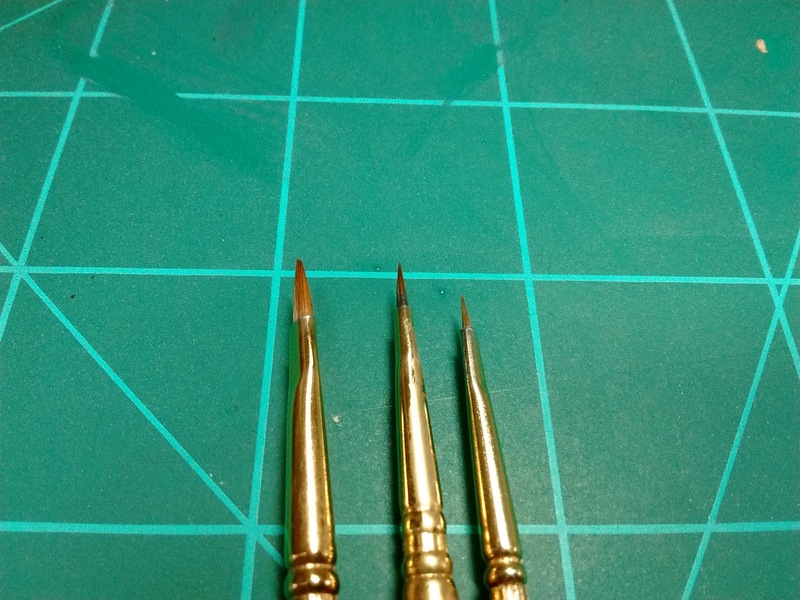 The brushes sold in the local craft stores are not very cheap, low quality, synthetic types that are not very suitable for painting fine details on scale models. A consequence of this is that in my desperation to buy any sable brush I picked up a set of brights pictured (size 2,1 and 0). These brushes are characterised by short bristles and a blunt tip. For general painting they aren't much use, the short tips hold very little paint and are too small for basecoating or glazing. 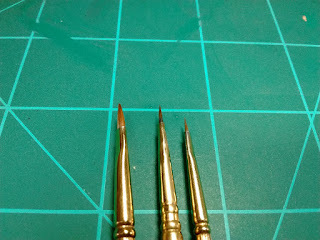 Instead I found they are ideal for stippling, edge highlighting and small details. The short, blunt tip allows for a lot of control and precision and they are surprisingly resilient. I treat them quite roughly and yet they have not deteriorated . These were not cheap, costing about $12 each but I would recommend at least getting the size 0 which is the one I use the most.